The time schedule for research must be clearly established from the outset. Timing should be a part of the proposal and discussed at meetings concerning the proposal. If management wants to move more quickly, it must adopt a different research method. The research schedule must be agreeable to all parties and, once established, the schedule must be followed as closely as possible. Some departments in the firm will be waiting for and depending on the findings of the research and a delayed study can be costly. Delays can prevent these departments from going ahead on other projects that may be even more important to the firm. Everyone has to realise that some schedules may have to be changed. New and unexpected findings may have to be pursued, perhaps producing a change in research technique. A proposal should allow for such possibilities, even though the importance of staying with the original schedule is recognised. • Establish motivation for research project. • Establish purpose of research project. 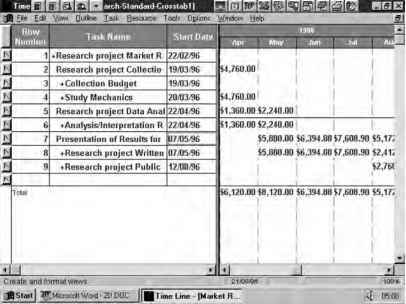 • Determine budget for research project. • Find and review previous research on research topic. • Select data collection method. • Prepare focus group materials. • Describe population; sampling frame; sampling method/size.